Henry VII ordered the Sovereign to be struck as part of the process to stabilise the English economy after decades of civil war. The King commissioned the great German engraver Alexander of Bruchsal to design the coin, showing Henry VII enthroned on the obverse and a Tudor rose enclosing a shield on the reverse. Its value was 240 silver pennies or twenty shillings. This was the first Sovereign – it was struck in 23 carat (95.83% fine) gold. King Henry VIII increased the sovereign’s value from 20 shillings to 22 shillings then 22 shillings and 6d. His son, Edward VI fixed the value at 20 shillings and also issued a half sovereign, a “Fine Sovereign” of 30 shillings and a double sovereign. After his death in 1553, his half sister, Queen Mary issued only a “Fine Sovereign” of 23¾ carats. Mary died in 1558 and her successor, Elizabeth I re-introduced a “standard sovereign” of 22 carats, worth 20 shillings, circulating alongside the fine sovereign. James I eliminated the fine sovereign and introduced a smaller, lighter sovereign of 22 carat fineness in 1604. This was to be the last sovereign struck in England for 213 years. After the Sovereign there followed a succession of coins, of roughly sovereign value. First came the “Unite” of one pound value. It was so called in honour of the uniting of the kingdoms of England and Scotland. In 1612 the Unite was revalued at 22s before being replaced in 1619 by the “Laurel.” It survived the Civil War and was circulated during the Commonwealth, although a smaller 20 shillings coin, “the Broad”, was briefly issued in 1656. The Unite was issued for two years by the restored Charles II but was replaced by the machine-made “Guinea” (so called because it used gold from Guinea, West Africa) in 1668. In 1809 The Royal Mint was moved from the Tower of London to a new site on Tower Hill. In 1813 the last Guinea, with a value of 21 shillings, was struck by The Royal Mint but a huge transformation in how British coins were produced was about to take place. Using the new steam-powered minting machines of Boulton and Watt, the Mint could now produce superior coins more quickly and on an industrial scale. The Mint also now issued coins with a face value greater than their intrinsic value – the world’s first “token” coinage – and in 1817 came the return of the gold Sovereign after 213 years. On its reverse was the iconic engraving of St George and the Dragon by the brilliant Italian engraver Bendetto Pistrucci. This is essentially the modern gold Sovereign we know today, minted to 22 carat (91.7%) fineness, 22.05 mm in diameter and weighing 7.988 g.
The George & Dragon design continued to be used exclusively on the reverse of Sovereigns until 1825, when a shield design was introduced. The shield continued to be used intermittently throughout the reigns of George IV, William IV and Queen Victoria. As the British Empire spread across the globe, the sovereign went with it, accepted and trusted in even the most remote parts of the world. In 1855 the Sydney Branch of The Royal Mint was established. Uniquely, its Sovereigns (identified by the mintmark “S”) were completely different in design to the British originals. Other Royal Mints striking Sovereigns were opened at Melbourne, Perth and Ottawa, Canada. In 1917, under pressure of the war effort, The Royal Mint stopped production of the gold sovereign, replacing it with paper currency for everyday circulation. Although the Mint produced some Sovereigns in 1927 and proof sets in 1937 and 1953, this effectively marked the end of the Sovereign as currency. However, in 1957, in response to demand from collectors and investors, The Royal Mint issued bullion sovereigns almost every year until 1968, resuming regular production in 1974. In 1979 the Mint issued proof versions, which were so popular the practice continues to this day. In 1989 the 500th anniversary of the sovereign was marked by a special commemorative proof issue, while the Queen’s 2002 Golden Jubilee saw the shield design used, in modified form, on the reverse of a Sovereign for the first time since 1887. 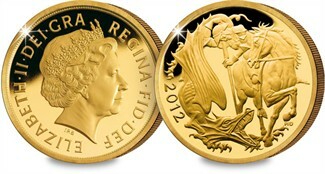 Most recently, the 2012 Sovereign featured a new reverse design by Paul Day to mark the Queen’s Diamond Jubilee. Over the past decade bullion and proof Sovereigns have proved a sound investment. As long as there’s a pound, it seems likely we’ll still have a Sovereign.